The Inter Rail pass is still one of Europe’s great travel bargains and well worth considering for backpackers and, indeed, all young people travelling on a budget. You can travel long distances for what works out at only pennies per kilometre. However, the Inter Rail ticket does have its drawbacks. Once you have your ticket you will be tempted to take incredibly long journeys in order to get your money’s worth. This can prove boring and also quite time consuming! Plus you will also find that whereas it is easy to make journeys on major routes it is quite difficult to plan rail travel on local lines until you actually arrive in the country. To get an Inter Rail pass you must be under 26 years old. You must buy it in your country of residence, having been resident there for at least six months. If you are 26 or over you can get an Inter Rail Plus pass or a Eurail pass which is not quite as good value but still a reasonably-priced way of travelling by rail. Your travel agent will tell you where to obtain your Inter Rail pass. Passes are available on a zone basis. A full Inter Rail pass is valid for travel in every western European country plus the Czech Republic, Hungary and Romania. You can also travel in Morocco and Turkey (even the Asian part) at no extra cost. It doesn’t provide free travel in the country in which you purchase the pass, although it does offer a discount. For a supplement you can extend your Inter Rail pass to cover ferry crossings across the Mediterranean, Irish Sea and Baltic Sea. It doesn’t cover the English Channel, however, so it is only worth taking this option if you are sure you wish to make use of the crossings it does cover. If you buy an Inter Rail pass it is very important to plan your journey carefully to get maximum value from it. Also take care not to overstretch yourself so that onward travel connections cost you more than you save. For example, you can get from Ireland to Greece and back in a month – sightseeing as you go – but only just! 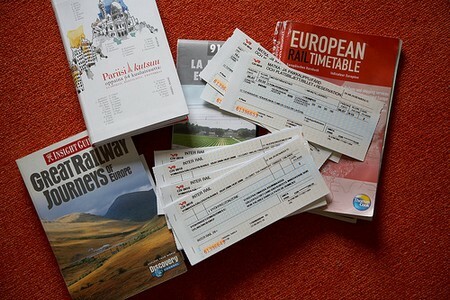 You will need a good timetable to plan your trip properly, and should also take it with you. Thomas Cook’s Continental European Timetable is the best timetable for this purpose and is available at most large bookshops. It doesn’t cover the smaller local routes, however -you can only find out about these once you are actually in the country yourself. Although your Inter Rail pass offers you unlimited travel try and plan the shortest journeys possible that allow you to see all you wish to see. Also try to plan a circular route rather than an outward and return trip on the same line. That extra journey might be ‘free’ but it is still very time-consuming and one side of the railway track looks very much like the other! One of the advantages of Inter Rail travel is that, as you are travelling mostly by train, luggage is less of a problem. There is plenty of room on most trains and there are lockers and left-luggage offices at the main line stations in most countries. This is ideal for the inter-railer who sightsees by day and uses the train as a ‘travelling hotel’ overnight. If you take a small day-pack as well as your backpack you can leave most of your luggage at the station and travel around unencumbered during the day! Do take some books and a personal hi-fi etc as many journeys are through industrial areas rather than attractive scenery. Where possible buy food away from the station and take it with you. Food is expensive in most trains and stations and not always of very good quality – plus if you get off to buy food and drink you could easily miss the train! Finally, always take security seriously. Robbers operate on some. trains and there are also petty thieves in most countries. It is a good idea to lock your luggage to some immovable object and keep money and important documents in a money belt. This is particularly important if you wish to sleep on the train – although it’s a good way of saving on accommodation costs it can be risky.